EXCITING: Buggy riding in Korcula. SEADREAM Yacht Club is adding five Mediterranean land adventures to activities available from the twin mega-motor-cruiser yachts SeaDream I and II from April to October. In an area laden with historical sites, beaches, captivating countryside and exceptional food and wine, SeaDream’s guided adventures will appeal to many. 1. 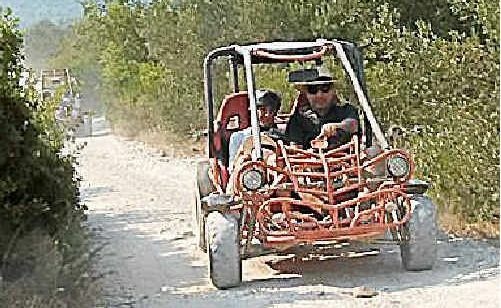 Korcula Island Buggy Safari (Korcula, Croatia). Experience Korcula Island in a two-seater convertible buggy. 2. Cycladic Cuisine – Hands-On Greek Cooking (Santorini, Greece). This adventure takes place in a traditional Santorini settlement, the village of Megalochori. 3. Rafting on the Cetina River (Split, Croatia). Raft the canyons and see the waterfalls and lush vegetation of the Cetina River. 4. The Splendido’s Italian Cuisine – A Taste Of Tradition (Portofino, Italy). Experience the cuisine of the world-famous Splendido Hotel. 5. Cinque Terre: Don’t Go Home Without It! (Portovenere, Italy). The picturesque five villages are a UNESCO World Heritage site. See your travel agent or visit the SeaDream website.